Researcher Gillian Thiel records water samples taken from a pond in the High Arctic near the Cape Bounty Arctic Watershed Observatory. Credit: Melissa Lafrenière. The study looked at how dissolved organic carbon (DOC) stored in Arctic permafrost - which is thawing at an accelerated rate due to climate change - is being released into Arctic watersheds as a result of physical disturbances that relocate nutrients across the landscape. 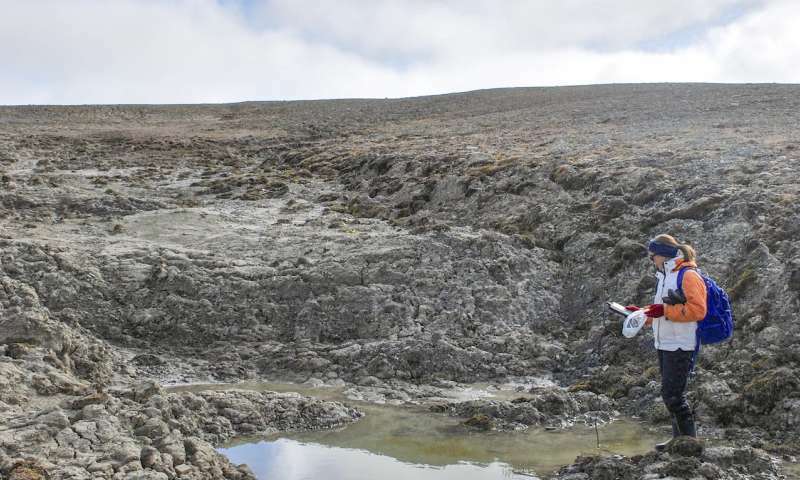 For the first-time researchers were able to determine that the chemical composition of carbon in these ponds is vastly different than in rivers in the High Arctic. "These ponds in the High Arctic seem to be hotspots for DOC degradation," says Myrna Simpson, Professor of Environmental Science at U of T Scarborough and co-author of the research. "Very little consideration has been given to what's happening with DOC in these ponds that are all over the Arctic, and it could potentially be a source of CO2 emissions released into the atmosphere with these disturbances." DOC is everywhere - it can be found in lakes, oceans and in soil. It's essentially decomposed plant or animal material that can dissolve by coming into contact with water. In the High Arctic DOC becomes mobile by entering watersheds, which is happening at an accelerated rate due to rapid permafrost thaw and the resulting change to the physical landscape. "The rapid thawing results in what's called active layer detachments," explains Simpson. "Think of these disturbances as landslides where soil and water gets all mixed up." When the DOC settles into ponds it can be biodegraded by microbes more easily than in rivers, which means more carbon can get released into the atmosphere. While past studies have explored how active layer detachments have stimulated microbial activity in Arctic soil, this is the first to look mostly at water sources including ponds. "We didn't measure how much carbon was being released because we didn't expect to find this," says Simpson. "This is one of the novel findings of the study - that these ponds could play an important role in the global carbon cycle." What's more, Simpson notes, the Arctic permafrost stores a lot of carbon because it generally remains frozen, locked into place for a long time. With rapid thawing of the permafrost, that's changing. In fact, using radiocarbon dating, the researchers found DOC more than 5,000 years old that was being degraded. Sampling of the water sources for the study was done by Queen's University researchers Associate Professor Melissa Lafrenière and Professor Scott Lamoureux out of the Cape Bounty Arctic Watershed Observatory near Melville Island in Nunavut. An important next step for the research will be to see how widespread the phenomenon is, for example if it happens in all Arctic ponds. But as Lafrenière points out, it's also important to understand the underlying mechanisms driving the difference between DOC in ponds versus rivers. "We need to do some mass balance studies to figure out the mass of carbon in these bodies of water. This includes how much carbon is present, and what are the main inputs and outputs controlling how much carbon is in the water," she says. In order to do that, they will need to measure not only the amount of carbon in the water but also the different forms of carbon including DOC, dissolved inorganic carbon, particulate organic carbon, gaseous CO2 and methane. Future lab and field experiments will be designed to figure out the processes responsible for gains or losses of carbon from these ponds, and also the process behind transforming carbon from one form to another, adds Lafrenière. Analysis of the DOC for the study was carried out in three different labs across Canada in order for researchers to use a host of sophisticated measurements. Professor Yves Gélinas from Concordia University and Professor André Simpson from U of T Scarborough lent their expertise to the study. Data was also collected and compiled by Dr. Jun-Jian Wang, a former postdoctoral fellow in Professor Myrna Simpson's lab, now an Assistant Professor at the Southern University of Science and Technology in China.